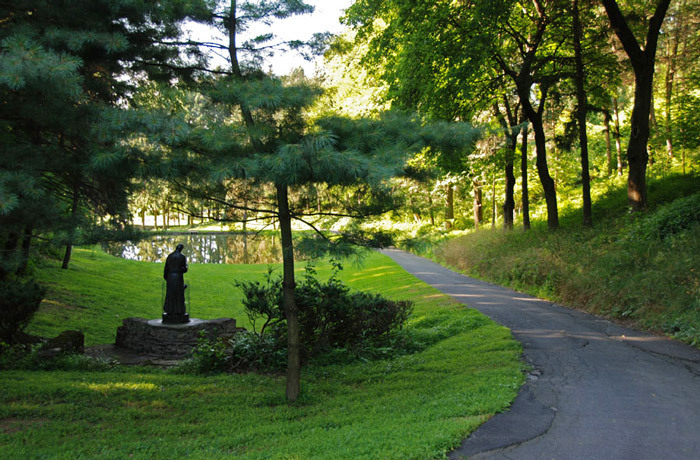 There are plenty of places to walk, think and pray at the Jesuit Center. Silence is beckoning me now more than ever: the opportunity to be totally unplugged, without even a book other than the Bible and my journal. Several years’ worth of waxy yellow buildup are obscuring my true self. 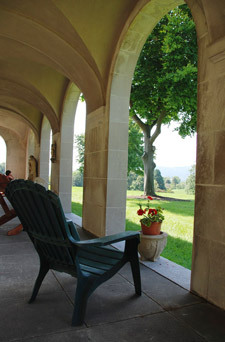 The last retreat I took was in 2012, with the Benedictine brothers in Weston, Vermont. It was not a silent retreat. This will be my fifth silent retreat. Except for meeting once a day with a spiritual director and attending Mass, everyone is silent — including at meals. That notion seems to horrify some people. My journal and I will spend a lot of time here in the evening. My first one was in 2006 at Bon Secours Spiritual Retreat Center in Marriottsville, Md. Since the first time I went there, the place underwent a thorough renovation; now there is a private bath and internet in every room, and it has lost the quality of spare monasticism. 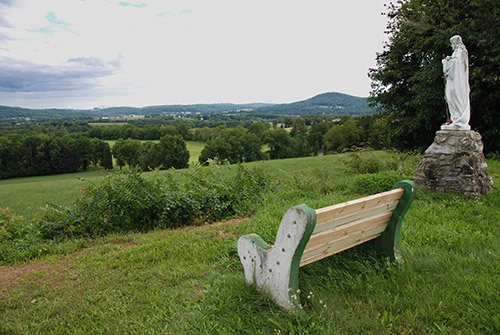 So I am going back to the Jesuit Center in Wernersville, Pa., set in the rolling hills west of Reading. Lots of nooks and crannies, no locks on the doors, and communal showers (I never see anyone because I am up at 5 a.m.). After a 5-year hiatus from retreats, I decided it was time to make the pilgrimage. The world has overwhelmed me. I don’t know how to respond effectively and spiritually to what is happening. At 61, I am very happy but still struggling with how to make a difference. I used to envision myself living in the inner city as a faith-based community organizer when I retired. I don’t even like driving into Wilmington, Delaware (population 72,000) any more. In fact, we drive the 27 miles to the capital of Dover (where our church is located) less and less. We are more focused on travel plans and the new fitness center and whether to move to a small town than on saving the world. I spend too much time on Facebook posting about politics and preaching to my choir of like-minded friends. No one or no world will be saved via Facebook. So when you feel that your world is more and more circumscribed and you are becoming mean-spirited and overly me-focused, what do you do? Well, it may seem counter-intuitive and a bit over-indulgent that one would go on a silent retreat for seven days to focus on reclaiming one’s true self – the original child of God who is buried under all that baggage and dysfunction and well-crafted defense mechanisms. I tend to read about prayer more than actually praying. On this retreat, there will be no how-to-pray books. Just me, my spiritual director, and God. See you on the other side.